There’s no industry legislation out there to say how often you should check your caravan’s noseweight, in fact in most cases, it’s very much up to you to decide. 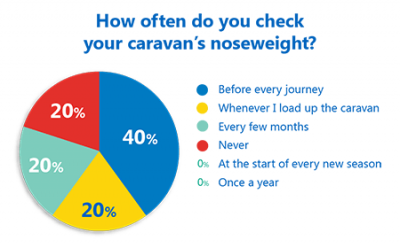 With this in mind, last month we wanted to find out more about your weighing habits; how often you measure your caravan’s noseweight and whether you think it’s an important part of everyday caravanning. Malcolm told us he checks his caravan’s noseweight “Every time I move my caravan”. Similarly, David said he carries out noseweight checks “whenever changing or modifying the load”. As you can see, 40% of voters told us they check their caravan’s noseweight before every journey. After that the results were evenly split; 20% voted in favour of checking noseweight whenever they load up the caravan, 20% said they check it every few months, and again 20% admitted to never measuring noseweight. Want to find out how to measure caravan noseweight? To learn why it’s so important to measure noseweight regularly check out this complete guide. Do you agree or disagree with the majority vote? Share your views in the comment box below. It is also important to check your mtplm, last year I took my caravan to a local weigh bridge out of curiosity, I was shocked to find my van was 74 kgs over weight. Time to take out all the bits & pieces we had collected & never seem to need, we also don’t stock up with to much food until we reach our destination. I measure noseweight at home before every outing. Fortunately my driveway is level and I can get the attitude of the caravan the same as it would be when hitched up because the caravan sits behind the car in the driveway. However, when I get the caravan out onto the road, the noseweight increases by about 15kg. The reason: the caravan body arcs above the axle, so that when pointing downhill, there is more caravan in front of the axle; the opposite applies when facing uphill. So it can be a bit of a black art to get it right depending on where you are when you measure noseweight. But also on a slightly different subject, the noseweight when hitched up becomes part of the towcar, and not part of the caravan weight. This is something ignored by the matching services. Thanks for your comments Jeff and Michael – very insightful indeed!